Use the following instructions to create a Talkgroup in WAVE. If you are a Partner or Partner Employee then click the name of the Customer to edit. If you are an Customer Employee then you are already in the Customer screen. The Talkgroup screen opens. All existing Talkgroups are listed. 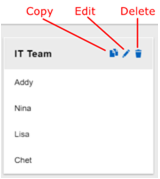 Click the large plus icon to create a new Talkgroup. In Talkgroup Name, enter a name for the new Talkgroup. A Standard Talkgroup may be used by anyone. A Broadcast Talkgroup may be assigned to any user but only a Broadcaster assigned to that Talkgroup may transmit. Non-Broadcast Users assigned to a Broadcast Talkgroup can listen only. A Dispatcher Talkgroup must be assigned to a Dispatcher User. Dispatcher Users communicate via the WAVE Dispatch application which runs through a browser. For more information see Adding WAVE Dispatch Users and Talkgroups. 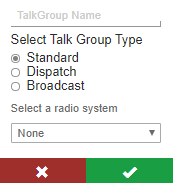 In the Select a radio system list, leave the selection as ‘None’ for a Broadband-Only Talkgroup, or select an existing Radio System if you are creating a Talkgroup that integrates with a Radio System. You can edit Talkgroups later if you need to add or remove a Radio System. Click the green check icon when you are done. The new Talkgroup appears on the page.